May I point out to ya'll our tags section, memories and pinterest. Hi friends, I'm going to be posting some stuff from my art blog ( purpleponyart). I just wrapped up a four month history of decorative arts and crafts course and it was SO fascinating. We covered ceramics, textiles, design, architecture, glass, furniture...you could easily get a PhD and spend a lifetime studying it. TBT to February when we went on a field trip to the Nickle Gallery at the University of Calgary. The Nickle Gallery has a huge Islamic rug collection that was donated to the gallery by a collector. You can browse the collection online. The bonus of going on a tour is that we were actually allowed to touch the rugs. This is a huge deal for textiles people who tend to be very tactile. First we looked at a handmade red and black rug that had a high pile and was made entirely from wool. 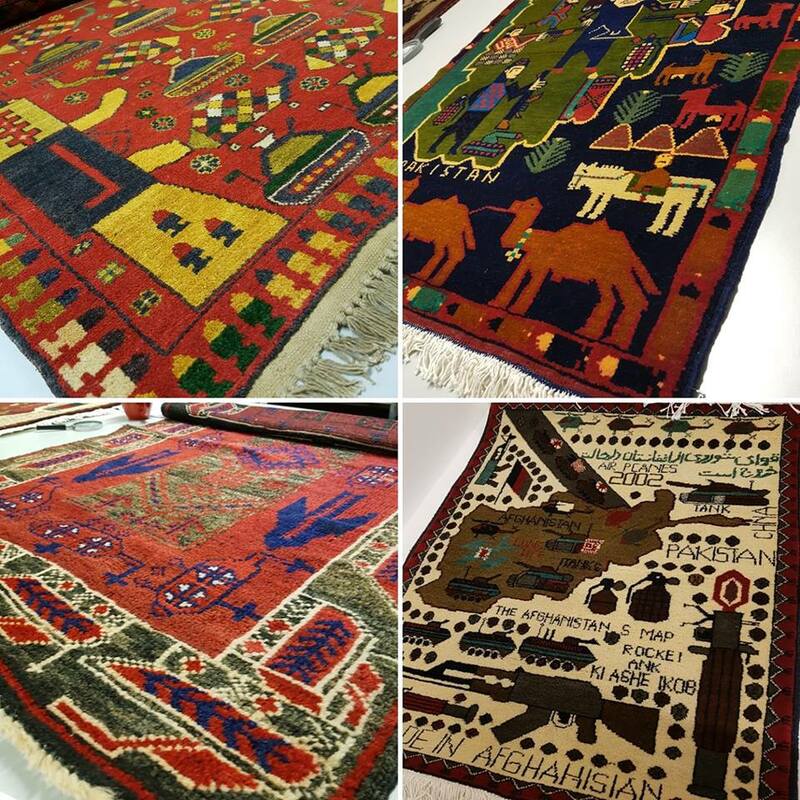 Rugs are everything in Afghan culture - a symbol of status and the product of a culture based on wool bearing animals. The rug was ornate in a simple way - it was made of symbols that could be easily memorized by a weaver. Hi crafty friends, I haven't done much crafting this year as I returned to art college while working full time. Even though I was just taking one class a semester, it was a lot of reading and writing. I write my final exam next Friday and I have been feeling stressed and squirrelly and I realized it's because I haven't been crafting! Last night I got together with my friend's service club at her church. She brings all the materials, we just have to bring the creativity! I ended up making five cards. 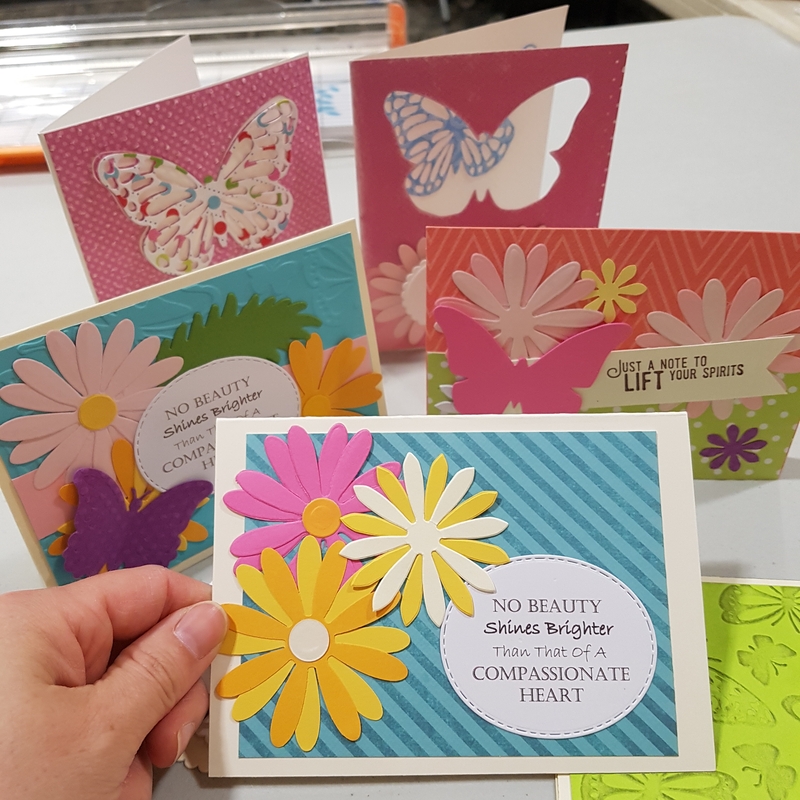 We're making generic cards that a local women's shelter can give to clients. So win win! Hello ya'll. I checked my email today and saw that ya'll have been dealing with a spammer. I'm so sorry. I banned her and deleted her posts. I also turned on moderated membership in hopes that it will help to prevent future spam bots. Since neither I nor parasite girl are around much anymore I promoted calzephyr77 and m0rbidm00n to mods. I started using this website called Stitch Fiddle. There is a free and premium version, but the free one will cover a lot of needs. I needed some cross-stitch software and somehow I stumbled across this site. It works on mobile and desktop and is very responsive for a mobile program. I ended up paying for it because I found it so useful and I love not being tied to my desktop. You can use it for knitting and crochet patterns too. Hi crafty friends, LJ can't help with the spam problem. Entries such as this https://craftgrrl.livejournal.com/14284616.html are posted by an identity account https://www.livejournal.com/profile?userid=85489727&t=I. Community administrators can delete these entries and ban the user from community the same way they do for any standard account user. Should they need additional information about banning in a community, please refer them to the FAQ at [https://www.livejournal.com/support/faq/84.html]. Detailed information about banning an identity account user can be found at [https://www.livejournal.com/support/faq/20.html#openid]. The technical username one needs to use to ban this Twitter-identity user is ext_5036802 . Additionally, community administrators may consider setting their community to moderated membership and/or moderated posting. So we would need parasitegirl, ilea, genericgirl or exquisitegeek to help. Hey folks, I complained to Twitter about the spammer, no luck. I filed a support request with LJ after reaching out to two of the mods. Hopefully they can help! 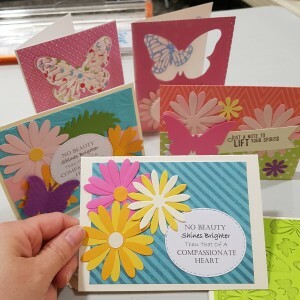 Well, this seems like an embarrassingly basic question, but can anyone give me some advice on how to get good results with rubber stamps? Most of the time I try to use them, large sections of the design do not actually show up. I've tried a few different techniques for applying the ink that I've found googling, but it still happens. Help! It's been forever since I knitted something! It took me about two weeks to knit this ~26x60" shawl with super bulky Copenhagen yarn from Michael's on a long Knifty Knitter. It's their store brand yarn and it was on sale for $4.77. I don't need more yarn - but how could I go wrong at that price? A lot of the colours in this line are not to my taste - there was an aqua, maroon and grey combo along with grey and lime green. Somehow someone came up with this pink and blue combo and it was easy to see the project take shape.